Receding gums are a sign of gum diseases such as gingivitis and periodontal disease. The gum tissue around the teeth wears out and is pulled away, exposing the roots of the teeth. When the gums are pulled back, more teeth and the roots of the teeth are exposed. The gums cover the roots of the teeth and fit firmly around them. Gum recession gives rise to pockets between the gum line and teeth. The food particles get lodged in these pockets and disease causing bacteria begin to infest and thrive there. If it is not treated timely then the supporting tissues can be severely damaged thereby injuring the bone structures of the teeth and resulting in tooth loss. Initially there is tooth sensitivity and later there can be swelling and pain and bleeding. Insufficient oral care which allows plaque and tartar buildup is the main cause for receding gums. Brushing the teeth violently and aggressively can also harm the gums. Neem has been used since centuries for its healing and curing powers. It is full of antibacterial, antifungal and ant-inflammatory properties which effect quick healing by destroying the infection causing organisms. People who are in the habit of brushing their teeth with a neem twig never face any kind of gum disease. Their gums and teeth stay strong and healthy. Chew some tender leaves of neem. Let their juice penetrate the gums and teeth. Then with your finger massage your gums for five minutes. Use this remedy twice daily. Coriander leaves have enormous medicinal values. It is rich in vitamins A and C and iron and potassium. Its antiseptic and anti-inflammatory properties get rid of infection very quickly and efficaciously.Chew some fresh coriander leaves every morning and after every meal. The pain and tooth sensitivity will go away and your gums will become strong and healthy and they will stop receding. Mustard oil has variegated medicinal uses. It has huge nourishing and stimulating properties that increase blood circulation and strengthen the gums. Its antibacterial properties eradicate the disease causing bacteria and leave the mouth and gums free from infection.Mix one teaspoon of mustard oil with a quarter teaspoon of salt. Massage your gums and teeth with it for five minutes every morning and at night before going to bed. 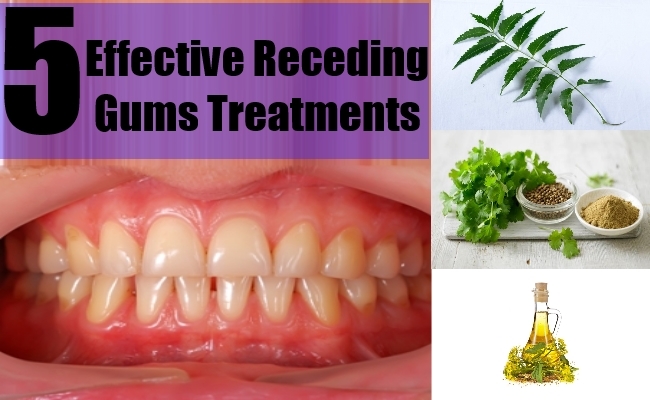 Alum has great antibacterial and cleansing properties which destroy infection and keep the gums strong and healthy. Grind alum to a fine powder and store in a jar.Mix a teaspoon of alum powder in a glass of warm water and rinse your mouth with this solution after every meal. Your gums will start healing very quickly. The pain and swelling will abate and the bleeding will stop. Tea tree oil has potent antimicrobial properties which eliminate all types of infections and effect a quick cure.Take a few drops of tea tree oil and with your index finger massage your gums with it for five minutes. Rinse your mouth with warm water. There will be immediate relief in the swelling and pain.